108 days, 24 projects, 23 hours per week, 1 life experience! Hello there – Ahoj! All good things come to an end. Unfortunately, my Comenius Assistantship has been completed two days ago and now I am back in my country, the warm and beautiful Greece! 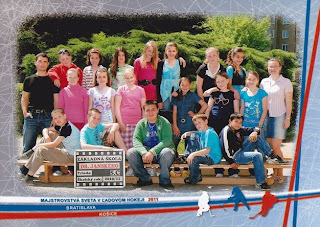 I have taken with me so many good memories, smiles, knowledge, ideas, pupils’ enthusiasm: a unique life experience which lasted 108 days (February, 28 – June, 15). During this short period of time more than 20 projects have been designed and implemented aiming at introducing the European Dimension in the Primary School Dr. Janskeho c.2, Ziar nad Hronom, Slovakia. 1. Let’s save Energy/ Energy is overconsumpted. I do care. 3. Fairy-tell me in English! 11. Where does milk come from? 14. European Commission on my School’s doorstep! 15. Let’s clean the hill! I would be glad to provide any assistance you may need in order to implement these projects into your classroom! Of course you can be inspired by them and further develop your own projects ;) For those of you who are interested in Children rights, Lifeguard & First Aid seminars and/ or Multilingualism, please drop me an e-mail at: lamiraklis@gmail.com in order to send you all the relevant material. At your orders! A BIG thanks to all who have helped me with my Comenius Assistantship! A BIG thanks to all pupils who actively participated in more than 20 projects that have been implemented since the very beginning of this Assistantship! A BIG thanks to the Greek National Agency (State Scholarships Foundation, Ίδρυμα Κρατικών Υποτροφιών) for its significant support! Thank you very much, good bye and Good luck! Dakujem vel’mi pekne, dovidenia a Veľa sťastia!